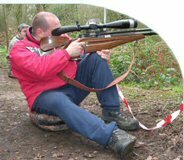 We now have club guns available for visitors and guests to be able to hire. A great way to try the sport, without spending money on equipment first ! These are available at £5.00 per session. If you wish to use this facility please email in advance, so we can book the equipment to you. The news page feature has now mostly become superseded by the clubs Forum. Please head over by using the menu to the left, or the following link, for general chat, results and latest news.